Representative Doug Walgren of Pennsylvania’s 18th Congressional District introduced H.R.812, the Malcolm Baldrige National Quality Improvement Act of 1987, on January 28, 1987. That bill, which was enacted as Public Law 100-107 on August 8, 1987, established the Malcolm Baldrige National Quality Award. The mechanism for granting these awards, established in the law, is a public-private partnership housed in the National Institute of Standards and Technology (NIST) within the Department of Commerce. The legislation provides authority to seek and accept gifts from private sources to carry out the program. The Foundation for the Malcolm Baldrige Quality Award was created to raise funds to endow the partnership. 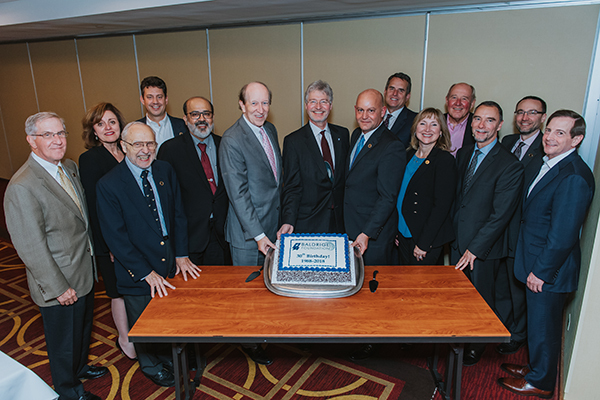 The Baldrige Foundation Board of Directors and special guests recently celebrated the Foundation’s 30th birthday. Shown here are (from left) Board Secretary Paul Worstell, Vice Chair Dr. Kathryn Eggleston, E. David Spong, Todd McQueston, Sunil Sinha, Board Chair Dr. P. George Benson, Dr. Walter Copan, Director of the National Institute of Standards and Technology, Foundation President and CEO Al Faber, Rulon Stacey, Debbie Collard, Lowell Kruse, Robert Fangmeyer, Director of the Baldrige Performance Excellence Program, Brian Lassiter, Board Chair of the Alliance for Performance Excellence, and Willian Troy, CEO of the American Society for Quality. In its 30th year, the Foundation’s efforts continue on two parallel tracks.